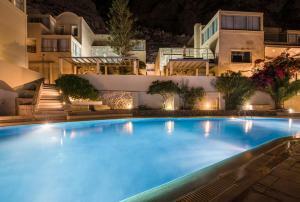 This exclusive 4 star hotel presents the traditional architectural style of the Cyclades. 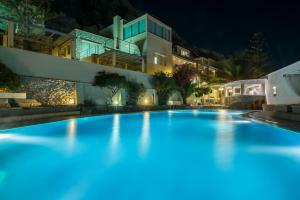 It is located in a beautiful and quiet area on the side of a hill, at the foot of the ancient Thira. Room with a private balcony, air conditioning, a flat-screen satellite TV and a refrigerator. It has a private bathroom with bathrobes, slippers, a hairdryer and free toiletries. Free WiFi is available. Upon arrival 1 water bottle and 1 fruit basket are offered. Suite with a private outdoor whirlpool, a fruit basket, a bottle of wine and a bottle of water upon arrival. For security reasons, children under 12 can not stay in this room. 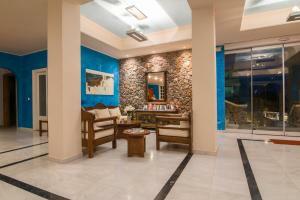 - Free entry to the sauna, hammam and hot tub. Upon arrival a bottle of wine, a bottle of water and a fruit basket are offered. 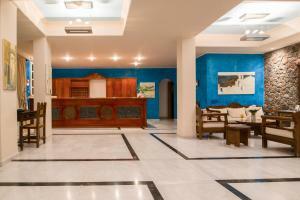 Suite with modern decor, a balcony, a minibar, a flat-screen TV and a safe. A bottle of water and a fruit basket are provided daily. This suite has a balcony, spa bath and DVD player.